Do you have a stopover in Nairobi coming up? Don’t waste it sitting in the airport (trust me, there’s not much there!). Instead, go and enjoy the city with my top 6 things to do on a Transit VISA in Kenya’s capital! All these suggestions are family-friendly and fun for all ages. Jomo Kenyatta International Airport is East Africa’s busiest airport, serving more than 7 million passengers annually. There are currently 5 commercial terminals, with direct connections to countries across Africa, Europe and Asia, and plans for an additional terminal to facilitate direct flights to North America. You may very well find that your intercontinental flight has a stopover in Nairobi and you need to transfer, perhaps to another airline, to reach your final destination in Kenya or other African nations. Located a short drive from the airport, Nairobi National Park is one of the smallest in Africa but is known for having one of the highest concentrations of black rhinos, as well as other abundant wildlife (see zebras, giraffes, lions, cheetahs, leopards, buffalo, hyenas, hippos, ostrich, baboons, vultures, crocodiles and various species of antelope). This is my favourite thing to do whenever I have stopover in Nairobi! We have had some of our most memorable animal sightings here and observing them on wide open grass plains against the backdrop of city skyscrapers makes for a truly unique setting. Explore the park in an open jeep with a park guide, who will always know the best spots to find wildlife and will take you off the beaten track in search of the encounters you are most hoping for. The ivory burning site, one of the most important landmarks in conservation, is also located inside the park. Here, presidents Daniel arap Moi and Uhuru Kenyatta oversaw the burning of large stocks of seized ivory in 1989 and 2016 respectively. In 1989, 11 tonnes of ivory were burned, sending a powerful message to poachers. This act was widely credited with sparking a reduction in poaching in Kenya at a time when the elephant population across East Africa was being decimated. In 2016, 100 tonnes were burned, the equivalent of tusks from 6000 elephants! 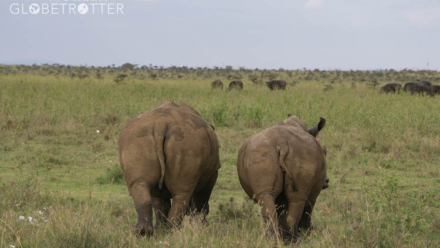 Located within Nairobi National Park, the David Sheldrick Wildlife Trust is home to orphaned black rhinos and elephants, who socialise with wild herds in the park every day, but are raised here until it is safe to release them. You can watch the animals being fed and observe as the elephants enjoy a mud bath, splashing and sliding about like a scene from ‘Dumbo’; keep your wits about you though incase one decides to aim a trunkful of mud your way! While the elephants play, you’ll learn each of their individual stories and what brought them here. Most of these rescued young animals have either been abandoned by their herds, typically as a result of drought, or orphaned as a result of poaching. You’ll also hear from the keepers about the pioneering conservation work of the late David and Daphne Sheldrick, the wider work of the Trust and opportunities to foster one of the animals. The Animal Orphanage houses a wide range of species including a number of big cats, hyenas, monkeys and a variety of birds. These animals have also been rescued with the aim of rehabilitating them and reintroducing them to the wild. The guides and keepers are incredibly knowledgeable and their positive relationships with the animals they care for is clear. You can learn about each animal while observing them at close range. Of course, we would much rather see all these animals living in the wild, but their time both at the David Sheldrick Wildlife Trust and the Animal Orphanage is typically only temporary and is with the best interests of the animal in mind. Established to protect the endangered Rothschild’s Giraffe, this is a conservation success story. Habitat loss in western Kenya saw this subspecies of giraffe pushed to the brink of extinction. Today, numbers are up (although there is still a long way to go!) and the centre has successfully released breeding populations into a number of Kenya’s national parks. At the centre, you can observe, hand-feed and interact with these curious and gentle giants; a wonderful experience for all ages! Nairobi is a bustling, cosmopolitan city that is in stark contrast to the natural beauty found in Kenya’s national parks, but it has much to offer beyond the sound of blaring car horns, the street sellers that tap at your car window to get your attention, the political propaganda that fills every available nook and cranny, and the churned up red dust that envelops the city. It’s a city that’s so full of life, both during daylight hours and at night, and I find the contrast between the buzz of the city and the laid back nature of Nairobians utterly captivating. Unlike other economic hubs across the world (think London, Paris, New York, Beijing), people here aren’t always in a rush. Kenyatta International Conference Centre: Take in a 360 degree view of Nairobi and its surrounding countryside from the 28th floor. On a clear day you can even spot Mount Kenya! Kenyatta market: Probably not where you want to come to buy souvenirs and artwork, but a fun way to pass your stopover in Nairobi! A mélange of hair braiders, who try to entice you into their salon; tailors, who sit at sewing machines surrounded by vibrant patterned fabrics; cobblers, with displays of brightly coloured shoes that rival those sold in Marrakech’s souks; and food stalls that fill the air with the smokey scent of ‘nyama choma’ (barbecued meat). Meander your way through the market, passing by the second-hand sellers and soaking up joyful hubbub, and be sure to haggle respectfully. Uhuru Park: Escape the hustle and bustle of downtown Nairobi in this oasis of calm right next to the city centre. Take a pedalo out on the lake, walk around the various monuments, picnic in the shade, and watch skateboarders compete in competitions. Karura Forest: An urban indigenous forest with plenty of family-friendly walking, running and biking trails, perfect for some light exercise and a breath of fresh air in between flights. Spend your stopover in Nairobi visiting waterfalls, bird watching, butterfly spotting or exploring caves. Nairobi National Museum, Botanical Gardens and Snake Park: All in one location, this is a great way to spend a few hours. The museum brings to life Kenya’s rich heritage, and permanent collections showcase both cultural and natural history. The botanical gardens will ensure some welcome fresh air before you board your flight; follow the nature trail through the gardens, showcasing the diversity of Kenya’s fauna, and past a number of art installations. The Snake Park is particularly fun for younger travellers, who will be given the opportunity to hold one if they wish. Snakes and other reptiles are housed both in open air enclosures and behind glass. The Park is primarily a research facility but gives visitors an opportunity to view Kenya’s reptiles that are more elusive in the wild. Nairobi Gallery: Built in 1913, this is a national monument located right in the city centre. Nicknamed the ‘Hatches, Matches and Dispatches’ building due to its historical use as a registry office, it now houses temporary art exhibitions. Karen Blixen’s House and Museum: Visit the farmhouse and gardens where author, Karen Blixen, lived from 1914-1931, and made famous with the release of ‘Out of Africa, an Oscar-winning film based on Blixen’s autobiography of the same title. Nairobi is energetic, colourful, unpretentious and will give you a wonderful glimpse at African urban life; it would be a shame to spend your stopover in Nairobi confined to the airport and miss out on all that the city has to offer! Carnivore is a meat-eaters paradise (but there are loads of scrummy vegetarian options as well). Try Kenya’s most famous selection of ‘nyama choma’ in a fun, family-friendly, open-air restaurant. Skewered on traditional Masai swords, food is grilled on a visually mesmerising charcoal pit, which dominates the entrance. Start with the soup of the day and then enjoy the all you can eat main course until you surrender your flag! Waiters carve and serve everything from beef, chicken, lamb and pork, to ostrich, crocodile and camel, at your table. This is accompanied by a selection of salads, vegetable dishes and sauces (your waiter will tell you which sauce is intended for which meat, or you can opt for a lucky dip!). The restaurant is open for lunch and dinner. Children aged 5-12 eat for half price and there is also a playground in the adjoining Simba Saloon. You won’t find much to eat at the airport so if you have a stopover in Nairobi, I suggest you eat here! How do I organise my trip? I highly recommend booking with Robert from Sojourn Safaris (you can find him on facebook @sojourn.safaris). We have met Robert on four different occasions and every time has been a pleasure. He will discuss your options with you via email or WhatsApp and work out your ideal bespoke itinerary for your budget and the time that you have. He has always planned a hugely memorable stopover in Nairobi for us, both when we’ve only had a few hours to spare and when we’ve had a full day. He’s punctual, knowledgeable, and we’ve always felt like no request is too great. Check your VISA requirements. If you need a VISA, you can get a transit VISA on arrival for $20 USD, which is valid for 72 hours. You can also get it online, but it is easy to do at the airport so it isn’t necessary to do it in advance. Please be aware that Kenya is at risk of Yellow Fever so a vaccination is recommended if you plan to exit the airport (please speak with your doctor to confirm your requirements). Border control will let you into Kenya without having had the vaccination but, when you land in your next destination, they will require all passengers who have exited the airport in Kenya to show their Yellow Fever Vaccination Certificate. If you don’t have it, you risk being refused entry or quarantined and vaccinated in the airport. Ditch the plastic! In 2017, Kenya banned the use, sale and production of plastic bags, and ignoring these rules will leave you liable for hefty fines and even a prison sentence, so don’t keep any in your hand luggage! Well done Kenya on implementing the ‘world’s toughest plastic bag ban‘! Have a wonderful stopover in Nairobi! It’s an inspiring city and I have no doubt that your brief time there will convince you to return! ften overshadowed by its neighbours to the north and south, Tanzania and South Africa, Mozambique is a hidden gem still relatively untouched by large-scale tourism. 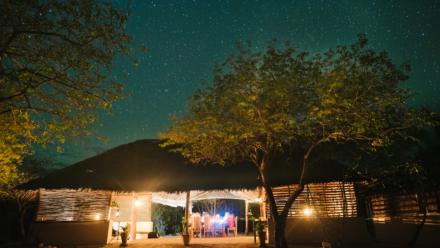 It was partly for this reason that Alex and I chose to get married on Mozambique’s white-sand coastline in the north; it’s picturesque, private and an ocean-lover’s paradise. Over several trips, we took the opportunity to explore the length and breadth of the country’s diverse and beautiful landscape. I have compiled a list of our favourite spots to see Mozambique’s wildlife, explore cities and bush, meet locals, relax and have some wonderful family (or child-free!) adventures. I recommend you drive as much as possible; we were able to see so much more, appreciate and understand the culture that much better, and come away with surprise experiences and stories that we otherwise wouldn’t have had. This itinerary is very possible to do in two weeks so as to accommodate school holidays or work commitments and will give you a wonderful taste of all that Mozambique has to offer, leaving you desperate to return for more! Mozambique’s capital is a bustling city full of people, traffic and noise, but it is also one of Africa’s most attractive capitals. Set on the shores of the Indian Ocean, Mediterranean-style buildings house restaurants, cafes, bars and guesthouses on wide, tree-lined streets. The warnings you may hear of Maputo being unsafe are seemingly unfounded; everyone we met was friendly and we felt safe walking around at night. Of course, feelings of safety are anecdotal and depend entirely on personal experience, but I have no reservations about family travel here. I highly recommend the craft market if you enjoy browsing beautiful artwork, sculpture and furniture. Be prepared to haggle but remember it’s a good rule of thumb to aim to pay what you think an item is worth, not the lowest possible. Parque Nacional Do Limpopo sits adjacent to Kruger National Park on the southern border with South Africa, and is a ‘big-five’ area. I recommend staying at Machampane Wilderness Camp, located a five to six hour drive from Maputo. Set in the heart of the African bush, it’s an opportunity to enjoy being surrounded by nature. The tented en suite rooms have basic facilities (running water but no electricity, and don’t be surprised if you share the room with ants and spiders) and rustic handmade furniture, including a comfortable bed for a good night’s rest. They’re certainly far more luxurious than any other tent I’ve slept in! The rooms overlook the Machampane river, which is home to hippos and a regular drinking source for other big game. Our ranger was incredibly knowledgeable about both flora and fauna. During our dawn and dusk hikes through the bush, we were taught to identify clues while tracking game, which plants to avoid, and which plants would offer a lifeline if stuck out here unexpectedly. After dinner, you can sit around a campfire with staff and other guests. The warming crackle of the fire, the blanket of stars overhead and the trickle of the running river, only briefly interrupted by the sound of elephants in the distance, all make for a relaxed evening affair after the excitement of the day’s adventures in the bush. Located three hours from Beira airport, I urge you to make the journey to Gorongosa National Park for an incredible safari experience. We had close encounters with lions and several huge herds of elephants, as well as many species of antelope. The resident warthogs, baboons and vervet monkeys are very curious and come right up to the secluded and tastefully furnished bedrooms. The elephants of Gorongosa are survivors of the Mozambique civil war, a period that saw the numbers drop from over 2000 to approximately 500 elephants. 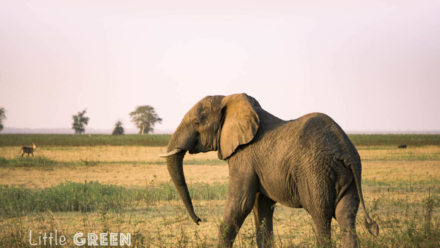 The emotional scars remain, as is common with elephants recovering from severe poaching. They are known to be anxious around humans and can charge if they feel threatened. Exposure to safe encounters with humans is reducing this anxiety but the guides are very knowledgeable about elephant behaviour so will keep you a safe distance and ensure you retreat if necessary. The park itself is beautiful and offers a wide variety of landscapes and ecosystems. Where Limpopo is quite flat, Gorongosa has mountains, forests and vast open plains. Take a trip to the Vinho community, which includes a boat ride and walk through the village. You will meet the locals and have an opportunity to learn more about their daily life, customs and traditions. When we visited, we struck up a conversation (translated by our guide) with a gentleman and his ten children. He was busy rebuilding one of his two mud houses for one of his wives. His other wife lived directly opposite in the second mud house, just a few steps away, and he split his time between the two houses and his two families. A very alien concept to us, a British family, but not uncommon here. One of the sons showed us round his mother’s house. Stooping to enter and with little space to move inside, the first word that came to mind was ‘claustrophobic’, particularly for a family of 8. He pointed out the living quarters and, at the side, the sleeping area. The floor was bare and there was nothing obvious to distinguish these zones. A humbling experience and a pleasure to meet these children, who happily play with their siblings and are overjoyed to simply be able to attend school. Vilankulos is the gateway to the Bazaruto Archipelago. Although many people pass through, Vilankulos is worth a visit in its own right and we found it to be less touristy than some of the other popular beach towns. I can recommend the Baobab Beach Backpackers hostel, which is located a ten minute drive from the airport and provides cheerful accommodation right on the beach in a relaxed, fun setting and at a very reasonable price. The town centre with its shops, cafes and colourful markets is an easy walk or tuk-tuk ride away. If you’re after idyllic but fairly extravagant luxury, Bazaruto and Benguerra Islands are the place to be. Relax and eat your meals sitting on the white sand beaches; explore the waters by kayak or on a sunset dhow cruise; ride horses across the island and take a walk up the towering sand dunes, meeting resident flamingos on the way. The helicopter ride between Vilankulos airport and the archipelago offers fantastic views and is highly recommended, but be warned that it doubles the cost of a one night stay! Located 4 hours drive or a charter flight from Nampula airport, Nuarro Lodge in Nacala is wonderfully isolated and combines ecotourism with the everyday luxuries of running water, electricity and WiFi. Built with sustainable, locally-sourced materials by the local community, they have an ethos of both environmentally and socially responsible tourism. Located on Nanatha bay, right on a coral reef, this is a beautiful location for watersports and relaxation. The lodge offers a ranging of diving packages but the snorkelling is also formidable. Bring waterproof shoes for children so they can walk on the rocks. We really enjoyed the company of the management team and staff from the local village. Ilha de Moçambique has several colonial buildings and attractions of interest. The call to prayer can be heard across the island from the mosque; just one of a number of examples where the coming together of two distinct cultures can be observed in the island’s architecture. Take a walk around the island and stop at local markets and shops. The Quirimbas National Park offers every ocean adventure you could wish for: scuba diving, snorkelling, whale watching, fishing, sailing on a traditional handmade dhow, and boat trips to neighbouring islands. I highly recommend Guludo Beach Lodge, a sustainable establishment that has been built with the environment and local community in mind. 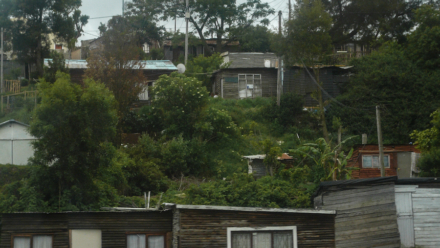 There’s no electricity or running water, and yet they still achieve luxury. This is where Alex and I had our wedding. Discover the ocean, play archery and volleyball on the beach, learn the crafts of pottery and palm leaf weaving, and search for wildlife from the lookout. A visit to Guludo village is an opportunity to experience rural life and shop for fabric (Guludo’s tailor is incredibly talented and is happy to make clothes, bags and many other items from your chosen fabric). You could even contribute to a community project run by Nema, Guludo’s partner charity. Africa is my favourite continent (of the five I have been to) and I feel drawn to keep going back, particularly to sub-Saharan Africa. Africa is certainly where my heart is! Of course, every country is different, with its own customs, culture and societal norms, but three things come to mind when I think of the African continent: the bold, bright colours of the landscape that are mirrored in clothes and artwork, and enable the collective African personality to shine; the music, led by the beat of a drum, that compels even the most rhythmically challenged to get up and dance; and the broad smiles of the people you’ll meet, so welcoming and proud that they are able to show you the country they love. Certainly, we experienced all this and more in Mozambique.